OK, yes, it's only March but it's not too early to start thinking about signing up for a CSA (community supported agriculture) farm share. In fact, now's the time the slots are filling up fast. If you're not familiar with the CSA model, here's how it works: individuals or families sign up for a farm share through one of the many participating farms in the area. Then each week during the growing season, you'll be able to pick up a "share" of fresh produce, depending on what's in season. Some farms focus solely on vegetables, while others include fruit, baked goods, eggs and even meat, depending on what type of program you're looking for. It's a great way to get lots of wonderful healthy food and support an area farm at the same time. But how do you know which CSAs have what, how much they cost, and where to find them? The Web site localharvest.org has a thorough listing of CSA farms searchable by zip code and provides some of the basic details of what each farm provides. Lucky for us, there are many CSA farms in the area, so AOA's put together a mini guide to several of the local CSAs to help you decide which share program would work best for you. One note from personal experience: While most full shares are said to be enough for a family of two children and two adults, I've found that to be a bit subjective. My mother has subscribed to a CSA for several years and the family eats a ton of vegetables. Sometimes she's found even the shares aren't enough. You might have to supplement a little. Oh, and feel free to share with us your experiences with CSAs! Cost: $250 for a Â½ share, which is recommended for 2-4 people and $350 for a full share. The low-down: You get both fruits and veggies from this farm, as well as herbs. Shareholders are offered the advantage of ordering extra produce when available on a week-to-week basis depending on what's needed. Products include sweet corn, salad greens, melons, pumpkins, potatoes, tomatoes anf more. Pick-up locations: Community United Methodist Church in Slingerlands on Tuesday evenings or the farm itself on Saturday mornings and Monday evenings. The low-down: Eight Mile Creek grows a large variety of vegetables, fruits and herbs _ over 175 varieties of veggies in fact. What makes this CSA a little different is that add-ons are available, including weekly or biweekly egg pickup. You can also add on cut flowers or cuts of beef. Cost: $495 for a 19-week season. What they offer: This CSA focuses solely on herbs and offers a culinary herb CSA or an herbal product one. The lowdown: With the culinary herb share, you get fresh herbs like French tarragon, basil, chamomile and numerous others for 10 weeks, from June 27 to August 29.The herbal product share includes teas, lip balms, homemade salves and other similar products. Those products are picked up on a monthly basis for a six-month share. Pickup locations: Saturday morning pickups are done at the farm in Huntersland, the Honest Weight Coop, the Harmony House Marketplace in Cohoes and Crossroads Gallery in Duanesburg. Contact: Betty Pillsbury, bpills@midtel.net or 518-827-8730. Pick-up locations: the farm, Albany Friends Meeting House Wednesday evenings, as well as locations in Clifton Park, Delmar, Niskayuna, Round Lake, Saratoga and Troy. Cost: $450 for the standard vegetable share. A 15-week fruit share including cherries, blueberries, peaches and apples is $150 and a 22-week egg share is $72. The low-down: Fruit and egg shares are also available in addition to the vegetable shares. The weekly share will average about 8 items with more in the peak of the season and less on either end. A share is said to be enough veggies for about two adults and two children. Shares last year included baby lettuces, sugar snap peas, strawberries, cantaloupe, garlic scapes, celeriac and beets. The farm also grows some more unique items such as fennel, edamame and tomatillos. Cost: $450 for a full-share and $300 for a half-share, with work hours required. The low-down: At Hand in Hand, the only way members can receive a share is if they complete a set number of hours' work each month over the course of the share season, bringing people directly into the farm to help their food grow. This farm may be one of the only CSAs in the area that grows 100 percent heirloom vegetables, which means, according to the farm's Brian Bender, that none of the seeds are genetically modified. He says they're kind of like "the AKC of vegetables." Pickup locations: at the farm on Tuesday and Friday evenings or at the St. James farmers' market on Delaware Ave in Albany on Tuesday evenings. The low-down: What makes this different than most other CSAs is that members get to pick out what they want each week. They'll receive an e-mail beforehand with what's available and then they get to pick out six or seven items. For those who don't respond, there's a standard default share. In addition to vegetables, there's also teas, fruits and herbal products available. You can also add on an additional egg share. Pickup locations: Unfortunately, the Albany, Troy, Delmar and Glenville locations are all full for the season but there's still shares left for the Schenectady area. Cost: $506 for 25 weeks of vegetables; $70 for 22 weeks of fruit. The low-down: A weekly share size should include about 10 to 17 pounds of produce, with 7 to 12 varieties of vegetables and herbs. No work hours are required, but members are invited to come to the monthly workdays on the farm where they'll be able to harvest some of the garlic the farm raises. A 20-week fruit share is also offered starting in July and includes peaches, apples, nectarines and cherries. Lamb, pork, turkey and beef is offered as a separate purchase to CSA members. Pick-up locations: Monday evenings at the Queensbury farmers market, Fridays and Saturdays at the farm, Saturday mornings at Saratoga Farmers Market and tentative locations in Glens Falls and Troy. Cost: A full season share runs 24 weeks and costs $500, while a 20-week share that begins in June costs$425. There's also a fall share from late October to December for $275. Microshares, which are a little smaller, are also available. A full season micro share costs $315 while the regular micro share is $260. The low-down: You'll get vegetables, herbs, melons and other small fruits. 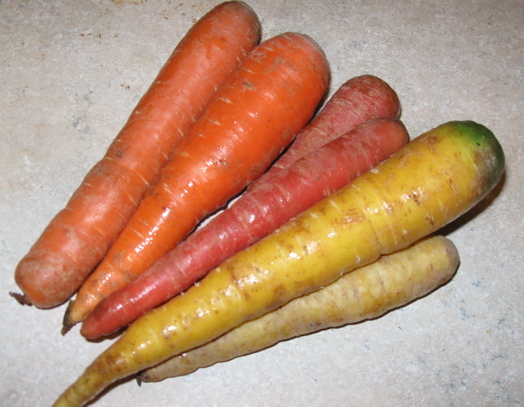 Crops include carrots, beets and other "normal veggies" but also things like artichokes, daikon and kohlrabi. Pick-up locations: Regional Food Bank of the Northeast NY at 965 Albany-Shaker Road or at the farm on Thursdays from 3:30 to 6:30 p.m. The low-down: What's cool about this farm is that it's run for the regional farm bank, so a large portion of the harvest goes to the local food pantries. CSA shares help fund this program as well as providing delicious, nutritious veggies. Oh, and the farm serves as a sustainable, educational program. There is no greater challenge to a home chef than to join a CSA. Have you ever seen an episode of Iron Chef where the featured ingredient was 10 pounds of celeriac? Didn't think so. Good luck with that, Batali. We're joining Denison Farm this year, and I cannot wait! Having a local place to pick-up is key, especially with the price of gas last year! Thank you so much for this post. I've been wanting to look into this for some time but have been too lazy to do the research. @Lucy - I just tried making celeriac for the first time recently. It's very good, but I don't know if I could eat loads of it. I had some trouble with the kohlrabi in my share one year. What do you do with it? Fortunately most of the CSAs include recipes. A few years ago, we did the Denison share -- it was absolutely excellent and highly recommended! Their greens are superb, and for real, it's way more food than you'd think. I'd love to do this, but there are WAAAY too many veggies in a typical share for a single person to eat. If anyone else would like to go in on a share w/me, lemme know at: medusasbedhead (at) gmail (dot) com. (I'm thinking Red Oak Farm might be the way to go, since you can pick what you want.) I'd love to do something like this, but I just don't want to waste a bunch of food and money in the process. This makes me want to commit again, but then I remember throwing away fresh endamame pods out of frustration, and the lettuce soup... Sometimes, there are just too many vegetables. @Jess----Kohlrabi is very nice in a light cream sauce w/chopped parsley. I never had it as a child, but then my stepmother used to make it like that and I really liked it. I'd say look for small kohlrabi so they aren't woody. I also think you can freeze a lot of these vegetables if you get sick of eating them during summer and you'll be happy to see them again next winter. On celeriac: My cure is to cook it in chicken broth until tender, and then puree it. The puree works in mashed potatoes, soups, and as the "gravy" in a winter savory pie with apples, sausage, leeks, and butternut squash. You can freeze the puree, too. No rush to do in ten pounds worth. On kohl rabi: My mother used to dice it and steam it, then dress the little cubes with butter and a little parsley. I never get enough to do that, so I slice it about 1/8" thick and use it as chips with veggie dip. Yum! The key to managing life with a CSA is what you do that first night. You spread everything out on the table, and make a menu plan based on what will go bad first and what will keep, and do some of the prep work right then. For example, deal with the edamame the first night, so they are a handy snack for the rest of the week, because otherwise you'll keep looking past them for something easy. Cook the ten pounds of celeriac right away so it isn't hogging space in the crisper. If you know you're going to use the carrots in brown bag lunches, make the carrot sticks and pop them in ziploc bags right away. I also use a recipe search engine to find recipes to use up the less popular veggies. We've found some really great family favorites that way. I'll also say from experience, when you lose your job, it's a great thing to know that you've already paid for vegetables and eggs for the next six months. It's like a great big security blanket. I just finished off some of the veggies I'd frozen over the summer. It's such a treat to pull them out of the freezer in the winter! The only reason I'm not subscribing to a CSA this year is because my mother is a prolific gardener who gives me plenty of extras and has me pick up her CSA share when she's out of town. oh,,, and learn how to can... you dont have be a grandma to can. you can use your microwave and make one jar as needed. perfecto!! Another nod to Homestead, we've been members for a number of years. Sarah does a fabulous flower share as well - the bouquets are beautiful! As for celaric, it mixes well with mashed potatoes (and ketchup if you are my husband). Our biggest vegetable challenge has been the Jerusalem artichokes we got as members of another CSA. The volume of vegetables can be intimidating; I do need to do a better job of using everything up (or processing for winter use) each week. We did a CSA last year but decided not to do it again this year. Too many of the vegetables we didn't really want and not enough of the vegetables we did want. There were bags and bags of mesclun salad greens that nobody in my family would eat except for me. They can't be frozen or canned and would be wasted after I had eaten all I could stand. I ran out of creative ways to use up cucumbers, too. And beets. And red cabbage. There would be occasional eggplants or occasional zucchini, but never in the same box so you couldn't make a ratatouille. I ended up supplementing from the farmers market and realized that I might as well just go there and get what I want. My mom's family must be a total anomaly - for them, it often wasn't enough - well, at least some of the portions were not enough. I hate to say anything bad about a CSA, but I took part in Hand in Hand last year and it wasn't a very good experience. I will say Brian was extremely nice, and it was their first year, but the quality of many of the vegetables was poor and I didn't receive some of the items they told me I would. There were weeks that the vegetables had gaping holes in them, and they put them in my bag anyway. I hope they work things out but I wanted to let everyone know of my experience with them. The Youth Organics group will be doing a farm share again this year too.